Alice Love is happily married to Nick. They've just bought a house, which they are slowly transforming into their dream home, and are expecting their first child. But then Alice wakes up on the floor of the gym after falling and banging her head during a class. 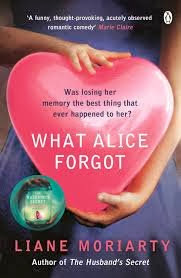 Ten years have passed but Alice can't remember a single thing since 1998. Alice is now a 39-year-old mum of three and rather than being head over heels in love, her husband despises her. Alice returns home, to the now completed house and the three children she has no recollection of giving birth to and attempts to piece together the last ten years of her life. I was looking forward to reading What Alice Forgot after reading The Husband's Secret last year but I wasn't prepared to love the book quite as much as I did. I was hooked from the start and really couldn't put it down as it dawned on Alice just how much her life had changed over the last decade. I felt for Alice as she was thrust into motherhood and struggled to come to terms with the state of her marriage. Not only had she forgotten the birth of her children but every single memory of them since and she didn't even have Nick to lean on as he seemingly doesn't even like Alice, never mind love her. As well as Alice, we get to know her sister, Elisabeth. Alice and Elisabeth were once close but there is a definite gulf between them now. Elisabeth has her own struggles in life, which she chronicles in a sort of diary, and my heart went out to her as she pored her fears and feelings onto the page.